I was wondering if anyone would like to do a scenario for that. Eg Diggers and a Blenheim or Fontenoy game? Failing that, I will do another Trans Mississippi ACW game. I have something in mind. This time set in 1864, and with very different armies. It would again use the additional Flags & sprites mod. If you are planning to play I would urge you again to complete the doodle. On Monday we again had 8 players, which would have been enough for 2 teams, had we known in advance. I'm also nearly ready to try out the next version of the KS Nappy mod. I'd like to test the 1806-7 Winter OOB on a couple of new maps. Maybe in a week or two we can give it a spin. any ETA on a reworked Reisswitz mod? meaning upgraded guns? Winter of 1806/7 OOB sounds fascinating! - looking forward to it! also fine with Blenheim or Fontenoy (even better) of course! Reisswitz is on hold, but for hopefully just a few days. Unfortunately I'm not a free agent at the moment. On the upside, Davinci is experimenting with tepee sprites for me, and if he succeeds the whole thing should look even more atmospheric. I should be able to put together a Fontenoy-period game for Monday. It'll be a continuing story from the last game where two fictional petty states, the Vereinigte Freie Stadt and the Grand Duchy of Lorraine are at war over a border disagreement. remember - heavy sabres - 10 paces! I'll continue preparing the ACW game, as that will come in useful another time. The rivalries of bloodline and border that have riven the recent histories of the Vereinigte Freie Stadt and the Grand Duchy of Lorraine have blown hot and cold for decades. It is now the mid 1740s and while the greater states of Europe are torn asunder by wars of great dynastic argument, in the middle Rhineland on the Franco-German border the concerns of lesser men bring no less a strife and disharmony to the stout citizens of these two states. Once again Fritz von Tarlenheim and Grand Duke Charles are drawing their two states into wars which, while petty sport for them, are dramatic enough for their soldiers, burghers and peasants affected by these games of aristocrats. In the spring of 1744 the diplomatic question of the province of Nancy, on Lorraine's north east border, was answered by application of the sword, where the pen had failed; a corps of Vereinigte Freie Stadt troops (in effect much of their small army) struck with speed and daring into the scattered formations of the Lorraine defenders and secured the provincial capital. With this accomplished von Tarlenheim's emissaries applied additional political and economic pressure on Grand Duke Charles' parlement, insisting that the mostly German-speaking region be given up to become a Freie Stadt province. The Battle of Nancy (fought Friday 20th March by Roland, Kevin and Martin) was supposed to secure peace but far from it, the diplomatic settlement of the marriage between Lady Nancy, the Grand Duke's niece, and Generalleutnant Halket, Graf von Ollendorf of the Freie Stadt army collapsed into farce when it was revealed that "Lady Nancy" was nothing more than a local barmaid from one of the town's bier kellers! Bearing a close likeness to the true Lady Nancy, the buxom and comely Esmeralda of Rosieres was, at the very least, satisfactory enough for Halket to make his wife! Nonetheless this state-sponsored deception was an affront to the honour of von Tarlenheim and worse was to come! South of Nancy lay a western province of the VFS, namely Cadaval, a narrow north-south finger of good rich farming soil lacking large communities but producing a great surplus of grain. The breadbasket of Freie Stadt was somewhat vulnerable to Lorraine attentions but for the alliance between the VFS and the Bishopric of Ehnheim, a small but plucky state that lies south of most of the VFS and east of Cadaval. 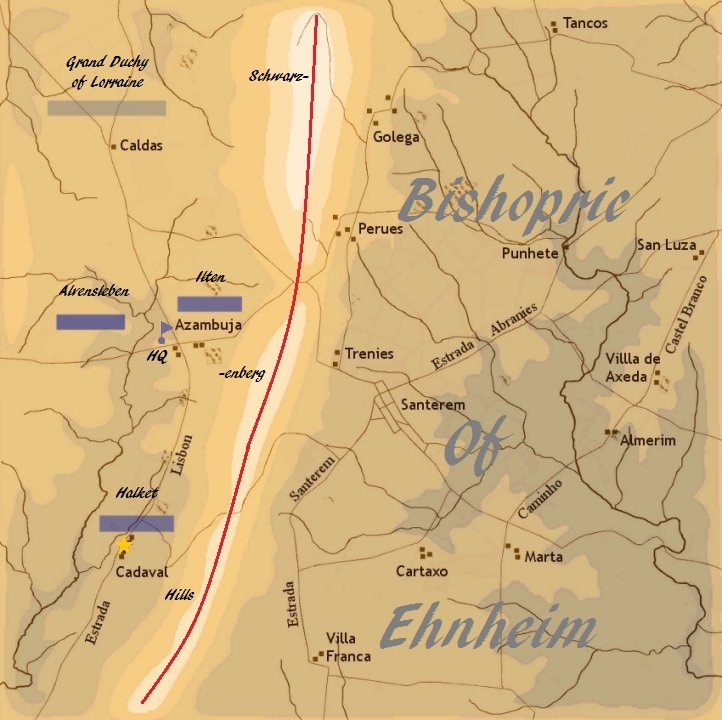 Ehnheim's capital is Santerem and here VFS diplomats held sway, the good Bishop, Ernst von Tippleskirch, being more interested in wagon loads of cheap grain than the hard cash offered by Lorraine. Last autumn however the harvest was not good, Cadaval's grain surplus was assigned by VFS accountants to be stored against possible famine in the state grain houses and little was available for von Tippleskirch to purchase, at least at the prices he had been hitherto accustomed. No sooner was this news about than Lorraine diplomats once again pressed gleaming coin into von Tippleskirch's hand. What exactly was their purpose was never made plain but by the autumn of that fateful year the Lorrainer army was on the march and this time south, over the border into Cadaval. Fate played the Grand Duke Charles a contrary hand and his plans were exposed by none other than Esmeralda von Halket herself. Bitter at being so tricked by Lorraine, when she became privy to some snippets from the Grand Duke's council chambers via her companion Lady Augustina Schatlouten, she at once passed the news on to von Halket in their bedchamber. Halket passed the shocking news to his superior officer, Prinz Karl August von Waldeck who in turn informed von Tarlenheim himself. The Lorraine plan was thus exposed - they intended to use the bad harvest and the lack of grain surplus to buy the Bishop of Ehnheim's neutrality while their army invaded Cadaval! With his famed military adroitness von Tarlenheim ordered Prinz von Waldeck to march the VFS army south-west and occupy Cadaval province there to secure vital places and receive the unsuspecting Lorraine columns and give them a bloody nose! We shall be using the Crampton Gap map from the Antietam add-on, so you will need this add-on to play. The player-commanded side is the VFS, defending Cadaval Province. Prinz von Waldeck's headquarters is at Azambuja with General Ilten's and General Alvensleben's divisions posted to block access to this vital crossroads. General Halket's division is in reserve guarding Cadaval itself. Cadaval is the objective for both sides. The Lorraine army is thought to be marching south on two converging highways that run from the Grand Duke's southern border, and are said by locals to be nearing the town of Caldas. The Bishopric of Ehnheim is neutral. The border between Cadaval and the Bishop's lands runs along the crest of the Schwarzenberg range of hills. No troops may cross to the east of the red-marked border. The Lorraine army will be AI controlled. The VFS army will need 4 players to command it as a minimum but as each division comprises two foot and one horse brigades, plus two companies of artillery, there are several brigade-size commands available. The battle starts at 5:00pm. Cadaval must not be occupied or contested by Lorraine forces when darkness falls at 8:00pm. a defensive battle vs the AI? - how big is the hord? Roland wrote: a defensive battle vs the AI? - how big is the hord? If I can prevent you from displaying the white feather, we may just survive. but but... there were so many.... then there was the wind.... and the smoke... and the trees, the horses were tired, the muskets overheated, lunch was terrible... oh... and it was my mommy's birthday, Mommy Sigel turned 87 you know? how big is the hord? Bigger than yours! Spies have reported that since Nancy the Lorraine army has undertaken a recruiting drive and also paid more mercenaries, so it is thought the VFS army is outnumbered. Do I recall correctly that there are two versions of this mod, one with reduced graphic quality? If so, does it matter which we enable? No, it makes no difference, only the visuals are different. Looking forward to tonight's game. When you say it is a fontenoy period game, I assume we will be using this mod? I've not played this mod before. There is a high and low res version of the Fontenoy mod. I think I would have to play the low res version or turn down the sprites quality. Could you let me know what mods are needed and their order. I use the lo-res one, my 4 year old PC can't handle the hi-res version above a division vs division battle but it does look gorgeous. I have an Nvidia GTX 460 SE card with 2 Gb of video memory. There are no incompatibility issues in MP if some players are using the lo-res version and some the hi-res. If your PC can run the Nap mod at best sprites quality, it should be okay with the lo-res version of this mod set at best as well. Other than that graphics-only mods like GCM/Jolly's terrain, smoke mods, etc are fine. Do not use any toolbar mods. I am using one of Kevin's minimaps of the Antietam map pack. Its Crampton Gap Portugal version. To get the Fontenoy mod to run this it is easiest to copy the entire contents of the maps subfolder of the KS Napoleon mod into the maps folder of the Fontenoy mod. You don't need to move all the maps but once you have, the Fontenoy mod will be able to access all Kevins nice Napoleonic period minimaps. I think I will keep to the low res version. My SSD is close to full too. I tried copying the maps into the mod, but it only gives me about 40% of the mini map. So I reversed that, and enabled KS Supplementary Maps and KS Nappy, and that seems to work ok.
For those of us who haven't played the Fontenoy Mod before, can you provide any tips please? Hi Martin, sorry about that. I think you also will need to copy POPUP_Map2.dds from the graphics/screens folder of the KS Nap mod into the graphics/screens folder of Fontenoy. 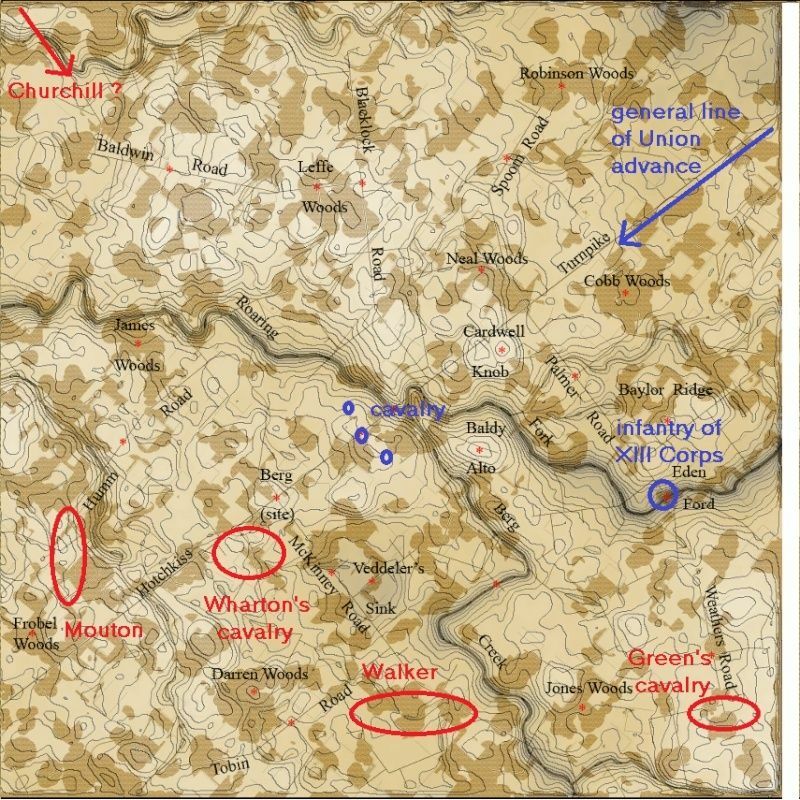 I don't think Supplemental Maps has any effect as it doesn't have the Antietam minimap files. They are only in KS Nap mod and I'd not want that activated at all as it has different logistics files in it. I am still working my through understanding these GUI screens - Kevin is the expert here. Kevin? In order to use the large nappy maps, copy the maps folder and the popup_map2 graphic as Digby described. Finally copy the file, gscreens.csv from the nappy \logistics folder to the Fontenoy \logistics folder. Now the full map will be displayed. If you use written courier orders, also recommend you copy over couriers.csv too. The stock version is almost unusable. I have prepared a late ACW scenario as a reserve, but if someone else has a game they would like to run, we can play that instead! A reminder that we see this as a fun and occasionally experimental session, where we try new things. This includes different mods and unusual scenarios. Recent games have featured mid 19th C European wars, Plains Indian Wars, ACW Trans Mississippi, and the Fontenoy Mod, set in the 1740s. Games will not always be balanced. All welcome, especially new players. We have 6 signed-up at the moment, which is about right for my 1864 ACW Red River Campaign scenario vs the AI. I'll post that shortly. Red River Campaign - After Shreveport. Confederate briefing. It is 16.00 hours on 20th May 1864. Last month Union forces from Arkansas and Louisiana combined to take Shreveport, the HQ of the Confederate Trans Mississippi Department. They are now advancing SW towards Texas. They are moving through a sparsely-inhabited area near the Louisiana-Texas border, from whence they can either move further SW along the Hotchkiss Turnpike, or S down Weathers Road. You are General Edmund Kirby Smith, commander of the Confederate Trans Mississippi Department. Formerly based at Shreveport! The enemy force is under the command of a political general, Nathaniel Banks. Unfortunately, the guy who really calls the shots is William Franklin (1st in his year at West Point), who nominally commands the XIX Corps. In the first half of the campaign, Franklin out-generaled Richard Taylor, and you were forced to sack Taylor. Thank goodness you forbade him to counter-attack Banks' much superior force at Mansfield. It would have been a disaster. You now have taken Taylor's former force, plus reinforcements from Texas, under your direct command. You have also stripped Confederate forces in Arkansas to the bone, leaving only some cavalry under General Price to maintain a presence there. The 5 brigades of Missourian and Arkansan infantry are good troops, and form a large division under Churchill somewhere to the NW of you. Churchill is a solid, but not especially aggressive, commander. These reinforcements have evened the odds somewhat, but the smaller Confederate forces are running out of time and space. You need a victory, fast. The Union army is operating deep in the Confederacy, and your intelligence on it is believed to be reliable. Since the capture of Shreveport, it has been weakened by the return of 10,000 troops who had been on loan from Sherman's army. Banks has also been obliged to leave a large garrison in Shreveport. To partially offset that, he has incorporated the Union troops from Arkansas in his army, and also brought up a division of the Corps d'Afrique from garrison duty at Alexandria. They form part of XIX Corps. Quite apart from your cultural prejudice against the former slaves, you believe them to be poorly equipped. They are certainly inexperienced. It is not clear what Union intentions are, but you face a dilemma. An advance SW and then W along the turnpike will bring them to northern Texas, where there are many Union sympathisers. A move 30 miles S along Weathers Road will bring them to Nacogdoches. Before evacuating Shreveport, you managed to evacuate many of its manufacturing facilities to Nacogdoches, and their loss would be a heavy blow. The local population there is still strongly Secesh, and it's perhaps unlikely that Banks is aware of this, but can you take the risk? Latest reports put a brigade of XIII Corps at Eden Ford, and some of Lee's cavalry at the ford SW of Cardwell Knob. Churchill's force from Arkansas will be under AI control throughout the game, although Kirby Smith can give him movement and combat orders for his division as a whole. Confederate units have a wide variety of flag patterns, as no standard pattern has been agreed in the Trans Mississippi. Something that obviously slipped your mind! Most of your troops appear in a wide variety of clothing - not excluding blue. Even the Union troops from Arkansas have a somewhat relaxed approach to uniform. All the cavalry is of the non-charging type. Both Union and Confederate cavalry vary widely in quality. Some of Green's Texas cavalry are probably the best troops in your army, being well-motivated and armed with infantry rifles. Better than Mouton's and Walker's infantry, which experienced discipline problems during last winter. Wharton's troopers are much less experienced, having thus far been on garrison duty in Texas. Usual ACW scouting rules apply. Please stay within 100-150 yds of friendly troops. This will be at about 19.00 hours - ie the scenario will be about 3 hours long. I will allow time for a *very* brief pre-game team chat if necessary, but the Confederate force starts the game reasonably concentrated, so feel free to exchange ideas by email before the game if you wish.